Keyboard Editor is a part of this program that does keyboard layout modification. It looks different in different editions of this program, but the main functionality is the same. For the details about editions, check the editions page. Important: USB keyboards have different handling for the Multimedia, Internet, Special and Power keys. This means that some of them cannot be modified using this program! making a ligature sequence (available under Pro and 2000 edition). making a non-character key assignment (with the right click, available under 2000 edition). Shift + Ctrl + Alt (or Shift + AltGr, if AltGr enabled). Character keys are keys that produce characters when pressed. Shift keys are keys that do not produce characters when pressed. These are: shift keys (Shift, Ctrl, Alt), function keys, Tab, CapsLock, Enter, etc. Some of these keys are editable only on Windows NT4.0, Windows 2000 and Windows XP. Please check at the 2000 edition details. Internet keys support basic internet functions (Mail client invocation, Home, Back, etc.). Can be modified only in Windows NT4.0, Windows 2000 and Windows XP operating system. Check the 2000 edition details. Multimedia keys support basic multimedia functions (Volume Up, Volume Down, Mute, etc.). Can be modified only in Windows NT4.0, Windows 2000 and Windows XP operating system. Check the 2000 edition details. Special keys include programmable keys, Power, Sleep and WakeUp key. These keys can be modified only in Windows NT4.0, Windows 2000 and Windows XP operating system. Check the 2000 edition details. It is not possible to change some key to be Power, Sleep or WakeUp key. This is due to the keyboard driver limitation. However, it is possible to change Power, WakeUp or Sleep key to be any other key (character or function). On some systems, these keys tend to keep their original function beside their new function. In other words, if you make for example Power key to produce the 'a' character, it will produce that character, but on some systems, it will also power down the computer. To prevent this from happening (i.e. to override original function), you need to go to the Control Panel, Power Options and to set default behaviour for the Power and Sleep keys to: "Do nothing". Important: USB keyboards have different handling for the Power keys. This means that on some USB keyboards Power keys (Power, Sleep and Wake Up) cannot be modified using this program! A dead key is a key that does not produce a character. It is usually used for diacritic (accent) generation. A diacritic is a special accent that is added to the character when accent (dead) key is pressed followed by normal character. When you press that kind of a key together with another key, an accented character, that is a combination of former two characters, is produced. Diacritics are preserved in Medium, Pro and 2000 edition. Diacritic Editor can be invoked by clicking on or by pressing F2 key while editing. Add button adds another diacritic combination. Remove button removes the selected row in the diacritic table. To edit the character which will "carry" the accent, first click on the Char cell, then click on the apropriate character in Character Map. To edit the composed character, first click on the Composed cell and then on the accented character (that is the combination of accent character and the "carrier" character) in Character Map. 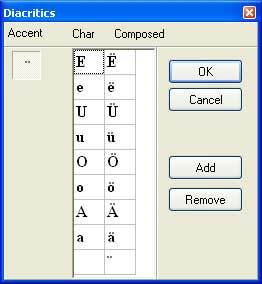 Diacritic editor is supported in Pro and 2000 editions. Ligature Editor is a part of this program that is used to manage ligature sequence. Length of ligature sequence is adjusted with the length spin button. To assign a character to the sequence, first click on the appropriate cell in the sequence and then to the character in Character Map. Ligatures are preserved in Medium, Pro and 2000 edition. Ligature editor is supported in Pro and 2000 edition. This button resets a keyboard to the USA layout. This button resets a key to the USA layout assignment. This button clears all key assignments. It is similar to backspace pressing while editing keyboard. Windows NT4.0/Windows 2000 file (only if this program is installed under Windows NT4.0 or Windows 2000). Keyboard Layout Manager file (the same for every operating system). First two options are available only under Pro and 2000 editions. This button imports a layout from one of the file formats listed above. This button does automatic Virtual Key assignment. This feature is useful when moving a key to a new location. For instance, if you move the character 'c' to the new key, you expect that when you press Ctrl + 'new_key' the computer performs the 'copy' function. If you do not press this button after moving the character, the computer performs the 'copy' function only in response to the Ctrl + 'old_key' combination being pressed. This feature just 'follows' new key assignments and tries to put corresponding Ctrl + key combinations in the right place. Character value on the key must be between 'a' and 'z' (for normal state) and between 'A' and 'Z' for the shift state. Shift value must be the uppercased normal value. This means that for example, in normal state you have 'a' and in shift state you have 'A'. The key must have Caps Lock flag turned on. 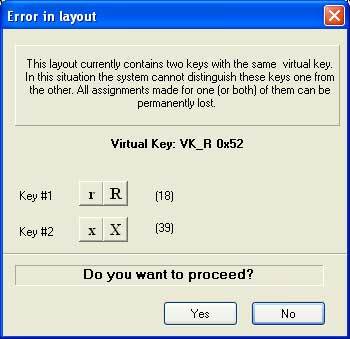 If the key meets all three conditions, then the appropriate VK assignment will be placed on that key when Resolve VKs button is pressed. Virtual Key combo box is used to display and set Virtual Key for the selected character. It can be done for character keys only. Shift keys have their own VK assignment. This feature is available in 2000 edition only. Resets Virtual Key to the US default. This is useful when a key cannot be mapped (for example, in French layout, the '!' key). In this case, you should Click on this button, assign a character and click on the Resolve VKs button (in order to correct Virtual Keys assignments). This feature is available in all editions. Also, it shows various messages about saving process, depending on the program edition and the operating system. This button cancels layout editing and closes Keyboard Editor window. Scripts are necessary only under Windows 9x operating systems. If you need accented Cyrillic letters, here is the link to the accented Russian font: Russian Screen and Printer Fonts. Numeric keypad can be edited in 2000 edition only. However, decimal separator key can be edited in all other editions. This check box makes a key sensitive to Caps Lock. This check box makes an alternative character when Caps Lock is pressed (different than the one with Shift pressed). To define a character which will be used when Caps Lock pressed, you need to check this box, click on the Caps Lock buton and click on the character on Character Map. This makes that new character appear instead of the Shift+key combination. This check box makes a key sensitive to Caps Lock when AltGr + key is presed. This means that if AltGr + key is pressed and CapsLock is on, the resulting character will be as if Shift + AltGr + key was pressed. 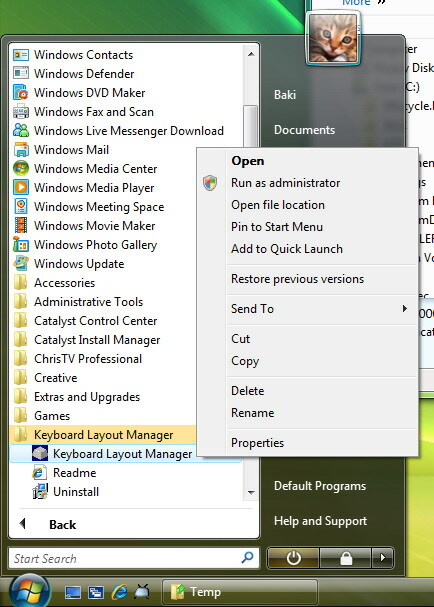 This feature is automatically supported under Windows 9x and cannot be turned off. Toggles hex/decimal representation of a character assigned to a key combination. Gives hex/decimal representation of a character assigned to a key combination. Enables right Alt or AltGr, if checked. This feature simply makes Ctrl + Alt + key equal to AltGr + key. It is usually used to produce additional (international) characters. This feature is supported in in Medium, Pro and 2000 edition. Enables Shift Lock behaviour if checked. This feature simply turns Caps Lock off when Shift is pressed. This feature is supported in in Medium, Pro and 2000 edition. This feature works on Windows 2000 and Windows XP only. On Windows NT4.0/2000/XP there are five special keys: Esc, Return, Tab, Space and Backspace. Those five keys can be edited when clicked on this button. Clicking on this button will invoke Special Keys editor that will help you set appropriate characters for those five keys. This feature is supported in Pro and 2000 edition. This feature works on Windows NT4.0, 2000 and Windows XP only. To set character, you need to select appropriate key in the Keys radio button group and to select appropriate key combination in the Key combinations radio button group. Left Shift+Back will make "left to right marker (LRM)". Right Shift+Back will make "right to left marker (RLM)". In a case of bidirectional language such as Arabic or Hebrew, combination of backspace key with the left or right shift key will insert the "left to right marker (U+200E)" or "right to left marker (U+200F)" control character. This feature is supported in in Medium, Pro and 2000 edition. This feature works on Windows XP only.